Aimee apparently entered the hospital to give birth yesterday, as husband Moses Chan (陳豪) suddenly backed out of a scheduled appearance to promote for the upcoming TVB Anniversary Awards in Tsim Sha Tsui. Moses did not notify the organizers until 12 noon yesterday, causing many to speculate that he had accompanied Aimee to the hospital. Since the couple’s wedding celebrations in France and Canada in June and July this year, Aimee rested under her parents’ care in Toronto, Canada in her first few months of pregnancy. 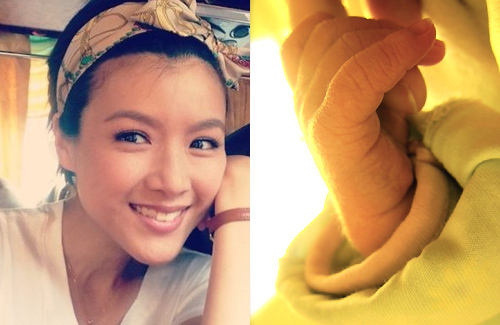 She returned to Hong Kong in September in her last trimester of pregnancy. This was more convenient for Moses to continue to work locally and for him to remain by Aimee’s side during the baby’s birth. Aside from making brief promotional appearances, Aimee halted all work to rest and stay in her best form when the baby arrives. The couple were spotted earlier shopping for baby items. Moses also leaked to the press that Aimee was in the final stretch of her pregnancy term. The couple had prepared a “hospital bag” with necessities that they can take along once Aimee experiences contractions. Moses is scheduled to make an appearance later tonight in Admiralty and he is expected share more details about his son’s birth then. Congrats to Aimee and Moses’ son! I was expecting the baby to born around Christmas, as that was what the couple had hinted earlier. The due date does mean the baby is gonna born on that day. How many babies out there are actually born on their due date. Not much. But it should not be a month early, max. 2 weeks early under normal circumstances …………. the due date was miscalculated or (announced wrongly) by the couple. The baby will come out whenever he’s ready. Anyway, congratulations to Aimee, Moses and their son! Agree! I find this couple always not telling the truth from marriage till giving birth not surprised they frame the reporters again after all they also want some privacy. I was surprised too but it seems like he may have been born prematurely like Marie Zhuge’s son. Aww ^^ Congratulations to Amy and Moses! Does that mean Aimee’s coming back to work soon? nooooooo………. We allow the likes of Linda Chung and Eliza Sam the hit the TV screen, so why not Aimee Chan? Comparatively, she’s not any better or worse than the two mentioned above. to me she’s the worst, you don’t need to agree. these past few months has been bliss without her. I agreed. She’s worst than Eliza. Having her in the series makes me don’t want to watch it. Has it really been 9 months?! Wow! the baby resembles Aimee a bundle of joy for their family! Grats to both on the happy occasion! Congratulations to the both of them. The best Christmas gift ever! Let’s take a guess. How long before the HK media starts scrutinizing Aimee’s pregnancy weight gain or her post pregnancy figure and start writing articles about her going on a diet?? I bet the reporters gonna harrrass bernice!!!! Congratulations to the growing family!! Happy news for sure!! Was he born in HK or Toronto? Congratulations to Mr and Mrs. Chan! Congratulatioms to Mr and Mrs Chan. Cute baby. Congratulations to Aimee and Moses on the birth of their son! Congratulations Aimee mama n Moses papa! Congratulations Aimee n Moses. The baby is so cute. she wrote in English or Chinese? Congratulations too Moses & Aimee!! The baby is adorable. Congrats Moses and Aimee!